Although a handful of Japanese authors have achieved widespread popularity in English translation, Kenji Miyazawa (1896–1933) is not among them. Reading this collection of 24 tales, it is easy to see why—not because his stories are bad, but because they lack many of the features that would allow them to fit more easily into modern American expectations. The closest analogue to the genre showcased in this collection would probably be the Western animal fable. Many of Miyazawa's stories are very brief, and some of them have an explicit or implicit moral message, as conveyed either through the lives of talking animals or the interactions of humans with such creatures. Only a few of them seem to draw specifically from Japanese folklore; many veer in a direction that feels more like fantasy, but without the strength of plot commonly seen in that genre, especially these days. Most of them are meditative in feel, aiming to suggest a thought more than achieve closure. The introduction, by the collection's translator John Bester, gives very little context for Miyazawa's life; for that, the reader must rely on the one-page potted biography that opens the book, which tells us that Miyazawa's stories have often been adapted as anime. Bester's introduction instead focuses on literary analysis of the tales themselves. 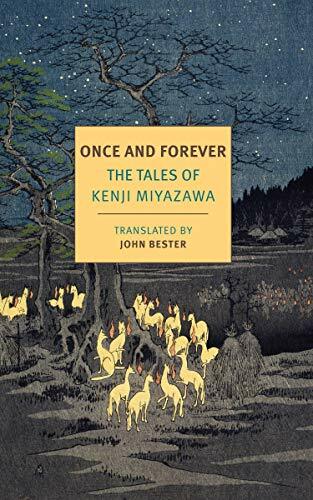 He states early on that "Miyazawa was first and foremost a poet: a poet concerned with particular beauties and general truths, a poet impatient—one feels—with the provisory truths and temporizations of everyday, 'real' society." Bester goes on to call out three themes for Miyazawa's imagery: the natural world, the history of Buddhism and various locales in continental Asia, and the technological changes wrought by the Meiji Restoration, which opened Japan to the outside world and began the country's rapid industrialization. The natural imagery is especially prevalent in these tales, not only in the presence of animal characters, but in the environmental detail that surrounds them. The short length and slight nature of many of these stories means they are often better appreciated in a poetic light than a plot one. Some of them, however, make for more substantive reading, including the two Bester calls out as being similar to western cautionary tales ("The Restaurant of Many Orders" and "The Fire Stone"), but also "Gorsch the Cellist," about a musician who improves unexpectedly, "The Red Blanket," about a child in a snowstorm, and "The Ungrateful Rat," whose title makes the content of the tale quite clear. "Then tell them this: General Son Ba-yu, Guardian of the Northern Frontiers, spent thirty long years out there in the desert without dismounting from his horse either by day or by night, and in the end his body became stuck to his saddle, and the saddle to his horse, so that it's quite impossible for him to appear before the king." There is humor in how the general is cured of his problem, and also profound kindness. The three physicians he visits do their best to help him, despite the rude disruption he brings with him, and at the end of the story he's permitted to retire—with his final official act being to request a reward for those physicians. This thread of compassion runs through Miyazawa's tales, and Bester calls attention to it in his introduction. Many of the stories lack any particular villain; those that have one are as likely to grant them mercy as to bring retribution down upon their heads. And even when the latter occurs, another character or the narrative voice itself often expresses sympathy for their erstwhile tormenter. That sense of kindness makes for gentle reading, despite the sadness and cruelty that often crops up along the way. Marie Brennan is the author of more than a dozen books, including The Memoirs of Lady Trent series, a 2018 Hugo Award finalist for Best Series.